The EHF will examine new technology. 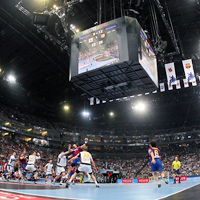 The EHF Competitions Commission dealt with the issue of goal decisions in the final split seconds of a match at its meeting on 25/26 February 2010 at the EHF Office in Vienna following an incident in the match Rhein Neckar Löwen (GER) versus F.C. Barcelona-Borges (ESP) on 20 February 2010 and subsequent official correspondence on the matter from F.C. Barcelona-Borges. The EHF Competitions Commission examined the issue in detail, noting that there had been previous similar situations in handball, where the decision of the referees on allowing or disallowing a goal in the dying seconds of a match had been called into question. It was therefore decided that the EHF will examine the technical and technological solutions and innovations that may be available on the sports market in order to provide more information to the referees in such a situation. The EHF will examine the implantation of any new innovation in the context of the current rules and regulations and will present their findings at the next meeting of the EHF Executive on 8 April 2011 for approval.